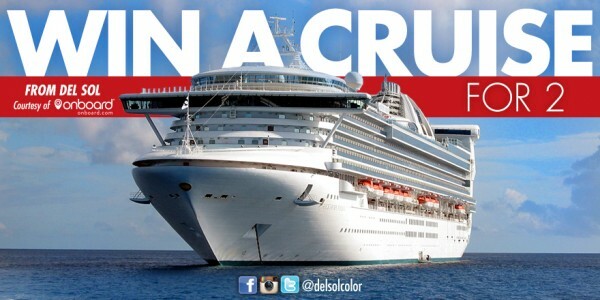 Del Sol is excited to bring its fans a chance to WIN a CRUISE for TWO in partnership with Onboard.com! No purchase necessary. This giveaway will start at 10:00 AM on Monday, December 1 and end at 10:00 AM on Monday, December 15, 2014. Rules: You must be a fan of Del Sol to be entered to win. How To Enter: Entrants must enter giveaway entry page located below and complete all required fields of registration form to receive entry into this Cruise for Two giveaway. Del Sol does not assume responsibility for third parties’ failure to act in accordance with these instructions, or for lost, interrupted, or unavailable connections. Duplicate entries, the same person with different e-mail addresses, are not permitted. Eligibility: The giveaway is open to legal residents of the 50 United States and the District of Columbia who are of age of 18 and older. Employees of Onboard Media, and PW companies as well as their immediate family members (spouses, parents, children, siblings, and their spouses) are not eligible to enter. This giveaway shall be construed and evaluated solely according to United States law and subject to all federal, state, and local laws and regulations. By entering, entrants acknowledge compliance with these official rules, including eligibility requirements. Entry Guidelines: Del Sol has sole discretion to determine that any entry that does not comply with these rules reserves the right to disqualify the entry. Del Sol has the sole discretion to determine whether an entry is eligible. By entering an email address, as one of the extra entry options, you’re agreeing to receive promotional emails from delsol.com and onboard.com. Grand Prize: The winner will have the option to choose (1) one cruise for two (2) a cruise for one (valued up to $1,500). Winner may select any sailing to any destination available at www.onboard.com. Prize will be awarded as a travel voucher redeemable for a winner-selected cruise. All taxes, airport fees, customs fees, or other surcharges are the responsibility of the travelers. Prize excludes air travel, government taxes and fees, port fees, gratuities, service charges, fuel surcharges, shore excursions, and other personal expenditures. If the actual value of the cruise is less than $1,500, the difference will not be rewarded. Prize must be fully redeemed by August 29, 2015 or winner will forfeit prize. Certain restrictions and blackout dates may apply. Travel companion will be required to complete a Release of Liability prior to travel. In the event that the winner is under 21 years of age, his/her travel companion must be 21 years of age or older at time of travel. Good luck and thanks for entering! You’re the best fans ever! This is an awesome trip indeed and I could so benefit from it. Thanks for sharing. Winning this would mean so much too me! My fiancé has been deployed for almost a year and returns home in May, taking a cruise with him would be a dream come true after going through such a long and hard separation! Thank you so much for this opportunity! I love Del Sol! I love the amazing color changing concept. Love the products. I love coming up with creative captions for FFF. A cruise with my husband, where we saved each other from previous miserable lives, would be a great way to celebrate our anniversary. I want be a winner. Thank you for the contest. My husband and I never got a honeymoon so this would be perfect! ! Wow what a great giveaway!!! Thank you for this opportunity!!! I would love to surprise my boyfriend with an amazing cruise! He works so hard! This would be a dream! I just love Del Sol and visit every store in every port I go to.I also shop in Myrtle Beach at the location there. I would like to enter the Cruise for Two giveaway, Thank you. I’d love to win the cruise to take my husband to celebrate our 50th Wedding Anniversary! Hoping for a golden champagne toast looking out at a golden sunset at sea to celebrate our golden anniversary! Had double knee totalreplacement surgery. I need a vacation so bad! Love the color changing polish. A cruise for 2 would be a wonderful gift for the holiday. What a wonderful thing to give away. Their colors are great and fun to wear. Want to cruise with my husband. i ❤️ your nail polish!!!!!! Would be great if the contest was open to CANADIAN RESDENTS also. I guess we don’t contribute enough to Del Sol…..
about how shirts and bags and even fingernails changed colors in the sun. Great Shows, and RELAX and meet new people. Del Sol is the best! I love your products. This would be such an amazing thing to win! I would absolutely love to take my amazing mother on her dream cruise to Alaska! Love my cool PCH shades. The “Win a Cruise for Two” Giveaway sounds amazing! Thanks for the entry opportunity. Del Sol is my new favorite store. 🙂 Wish there was one close to where I live. My Del Sol items are from the different ports I’ve visited on past cruises. I hope that I really get the chance to win this cruise. I went on my first cruise a few months ago and I went with y grandmother as a graduation gift. When we were on the cruise, we had gotten the chance to hear about Del Sol, and it was so fantastic! I even got the chance to go to one of the stores, and I bought one of the polarized sunglasses and signed up for my warranty, which was awesome! Getting to win this cruise would be one of the best things to happen to me! I would love to win this cruise!! I love Del Sol stores. Everytime I go to an island on vacation I will always go and visit the store and buy something. We really love your sunglasses. We all have some. Would really love to win a cruise so I can visit more Del Sol stores. This would be an awesome getaway and love the chance to win it! Never been on a cruise in my life. Have never been able to afford it. I would love to take my wife! Love all of your products. I would bring my daughter. I love your products. My husband and I would love to win this for our next Annv. trip. so when do I leave for my cruise? I would love love love to go on a Disney Cruise, please choose my hubby and I!!! We purchase our Del Dol sunglasses for ourselves and our family during the Caribbean cruises that we take in the summer. Thanks for the opportunity! Happy Holidays! Fabulous Giveaway! Thanks for the chance to Win! Happy Holidays! ♡ your products!! So obsessed with the nail polish! Thank You for this opportunity to be the Winner!!!!! I love items from Del-Sol and when we travel and find one I always buy the most wonderful things. We have been buying DelSol products for about 10 years on cruises we’ve been on. We were excited the last time to see different colors. We have bought nail products tons of shirts and we have 7bags to carry things We have bought for all 17 grandchildren They love showing friends how color appears. Wow, it would be so nice to win. Someplace to go sporting my Del Sol ware. I love Del Sol. I have shirts, hats, and sunglasses from Del Sol. love cruising and visiting Del Sol stores in all the ports. Sign me up for a cruise! I would love to go on a free cruise! My fiance and I would love to get married on a cruise soon! Man, I need a vacation. I freaking love Del Sol nail polish! I wish more shops carried it. Have had a pair of solize silver to blue sunglasses for 4 years. Good product. Del Sol take me away on a cruise!!!! My hubby and I are praying we win this chance of a lifetime!!!!! My wife loves Del Sol and has a lot of fun with it. She’s the one who shops Del Sol; I’m not a shopper. First shopped in Del Sol while on a cruise and have been a fan ever since. Fun products! Perfect gifts for my grandchildren too! I would love to take my husband on a cruise. He is so deserving of this after what he has been through. I wish everyone the best of luck. Love Del sol especially their sunglasses. Wouldn’t it be lovely to win a cruise for two??!! Thank you for a chance at the cruise give away. I am a fan of del sol products. Love Del Sol products. The quality is great and I have never had a problem with any that I have bought. I use the finger nail polish for stocking stuffers and the girls always look for the new colors they will be getting. The cruise for two would be an awesome way to spend my 25th anniversary with my wife. I love your products. I look for a Del Solar store where ever I travel. Thanks for such fun products. It’s the best gift for my wife when I want to surprise her with something small but fun. She loves all the colors. Can’t get enough of them. Reminds me of those color-changing Hot Wheels I used to get when I was a kid. Super cool! Love Del Sol! Visit the Galveston store as often as I can. Love the products! I would love to win the trip and use my Del Sol products! Just got back from St Thomas and got wonderful shirts. .
Love love love your products!! I love Del sol products! Thank you for such a wonderful opportunity. Neither my husband nor I have ever been on a cruise and we have been together for 10 years, married two three kids and have never been without them for a day since we met, and no honeymoon. This would be such a blessing! love the color changing nail polish!!!! While in Alaska this past summer, I came across the Del Sol & Cariloha stores. Bought the most amazing spice ever. Went on their web site to order more but to no avail. Can you please tell me how I can get more, without going back to Alaska. (Long way from Utah lol) It’s called ‘Pacific Seafood Seasoning’. It’s amazing on everything (not just seafood)! Thank you & have an awesome holiday season. Del Sol is awesome!!! I always visit the Del Sol stores when I’m in port on a cruise!!!! Just an idea as I am an animal lover that you guys should make collars, leashes, doggie t-shirts and sweaters that change color I am certain people would love and buy this stuff you could also do personalized name tags. Also I work with animal rescue and I know people would love and buy this stuff you could do cat collars too. Also I just love your stuff you should also do more than just the white shirts I would buy a shirt then because of my pale skin I can’t wear white shirts, so do you have other colors black or gray or pink or something. I don’t know what other entries I need. I would like to win your cruise for two. I am a total Fan of del Sol ! Love the nail polish! Love Del Sol products & recently purchased some for Christmas gifts. My Nieces will be so excited! Would love to win a cruise I haven’t been anywere in years lol ….. I heard alot of good things about del sol beatuiful ship !!! I would love to win this. My husband deserves it. He is so giving. He never tells me no. He is the love of my life. Love Del Sol stuff. My Grand-daughter gets stuff when I can afford it! luv your products have many…. Love del sol and love cruising. Sun glasses are awesome!!! I need to a relaxing cruise! We went on our first cruise last year and have completed booking our second just today! We purchased Del Sol products on cruise, which we absolutely love! I look forward to purchasing more unique items. Great job! Love Del Sol. Wish they would bring back the Gray butterfly hooded sweatshirt with the thumb holes. I love all of the Del Sol products, but need to see sweatshirts in more stores! I want to win a cruise.